Power Pic RGB Infrared for PIC 16F628 | Enide! The latest evlution of Power Pic RGB with Infrared remote control is for PIC 16F628 lovers. In short, it generates colors using a RGB LED, can be controlled using any infrared remote controller compatible with the Sony® Sirc code and has two auxiliary buttons for easy control even without the remote controller. This circuit is the fourth and final evolution of the Pic RGB project  in which the goal was to control a RGB LED and randomly generate colors. The microcontroller is now a PIC 16F628 and as before a pin with the Interrupt on Change feature is required to receive the infrared signals. There are now two buttons to control the circuit without the remote controller. As in the previous project, the infrared remote controller can be a cheap chinese universal remote controller capable of emititng Sony SIRC. The physical buttons have two functions each. Button 1 is the power button. When a short pulse is applied it will turn the LED on and off. Button 2 selects the working mode, also when a short pulse is applied. When a long pulse is applied to any of the two buttons, they will change the selected color, much like PR+ and PR- on the remote controller. Each button rotates the HUE in the oposite direction of each other. The schematic is similar in some aspects to the previous incarnations but the pins of the PIC driving the LED and the TSOP receiver are totally different as one would expect because a different PIC is used. From left to right we have the power supply based on a 7805 5V 1A regulator, below the power supply are three mosfets that will drive the LED, the microcontroller in the middle, below the TSOP1738 to receive the infrared signals and finaly on the right are the two buttons. Click the image to enlarge. Each mosfet can drive a maximum 600mA through its drain but according to Prolight each LED (red, green and blue) can only sustain 300mA which makes this mosfet perfect for the job. Summing the 3 LED currents we get 900mA not counting the current consumed by the 7805 and the PIC itself which should around 3 or 4 mA. The 7805 is able to supply 1A of current with a proper heatsink. 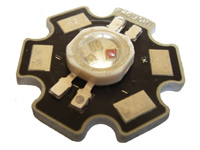 The TSOP1738 infrared receiver can be replaced with any model like TSOP1238, TSOP31238, SFH5110, etc. as long as the receiving frequency is between 38Khz and 40Khz. Ideally it should be 38Khz. R5 and C4 perform some filtering on the TSOP1738 supply voltage and R4 is a pull-up to maintain GP1 at 5V when no signal is being received. I didn't make a PCB for this project because I didn't have the need for it. The main reason for this project was to deliver a new software version for both pic12f and 16f families. 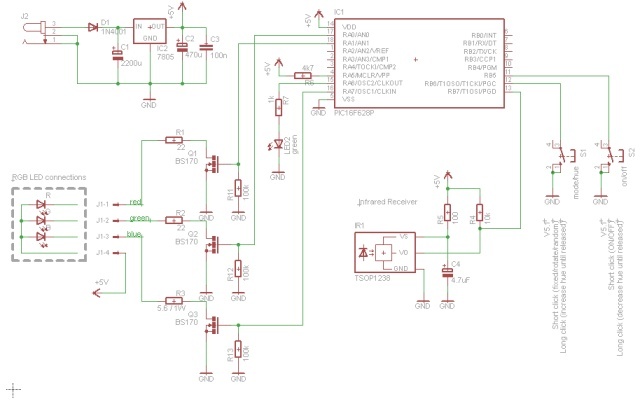 You can download the schematic in eagle format at the downloads section along with the software. The software is written in C and consists of a triple PWM modulator, a SIRC decoder and a HSV to RGB converter. The PWM modulator and the SIRC decoder are designed as device drivers and are fully interrupt driven. This way the main loop of the program is dedicated to do the remaining task of deciding what to do with the decoded infrared buttons and physical buttons. Value: the distance from the bottom of the cone, it represents the amount of light. 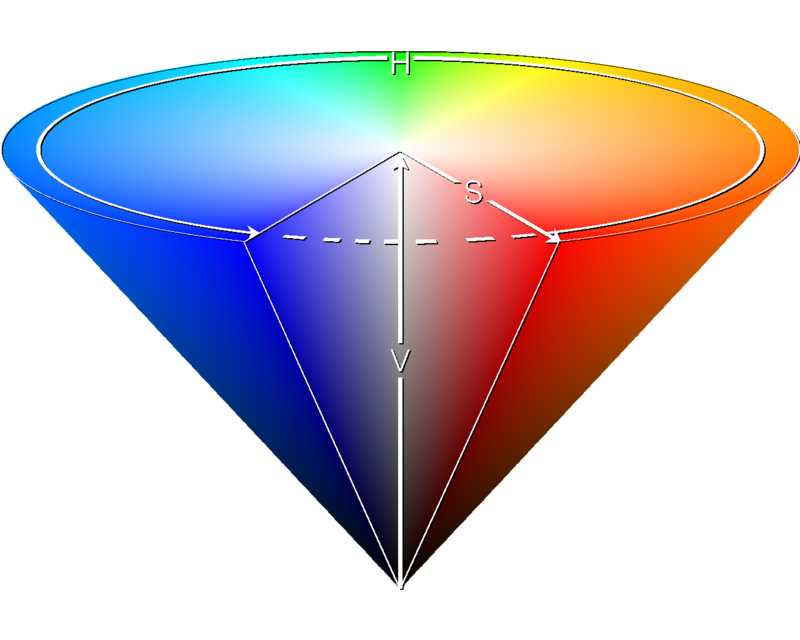 Using the HSV color space gives the user the ability to navigate along the color spectrum just by increasing or decreasing Hue. Adjusting Saturation and Value refines the selected color. This is a lot easier than asking the user to select the Red, Green and Blue components independently. As an example, imagining the user wants a light blue color, he/she should change the Hue until the color is near blue and then decrease saturation a little, until the light blue pleases him/her. Fixed color mode: user selects a color and that color will remain active until another color is selected or the working mode changes. Remote controller buttons 1-9, PR+, PR- and long pulses on any push buttons will select a color and change to fixed mode. Rotation mode: when active it will slowly rotate along the HUE circunference and will take 6 minutes to go around all colors. To enter rotation mode press 0 (zero) on the remote controller when fixed mode is active or press the second button with a short pulse. Random mode: when active it will change to a different randomly choosen color every 30 seconds. Random colors are selected using a uniform distribution function. To enter random mode, press 0 (zero) on the remote controller when rotation mode is active or press the second button with a short pulse. Random mode is distinguished from Rotation mode because on the former the status LED is lit. The status LED pulses whenever a valid remote controller code is received and when the circuit changes its working mode. When entering Fixed mode it will produce 1 pulse (much more visible than the IR pulses), Rotation mode will produce 2 pulses and Random mode 3 pulses and staying lit. 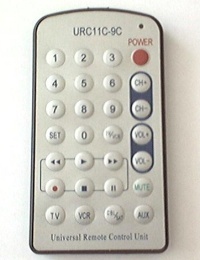 Button 0 of the remote controller allows to change in sequence between those three modes. Physical button 2 does the same (short click). The software works quite nicely in random mode and calls one's attention when the current active color and the new randomly selected color are far apart in the HUE circunference because it will produce a quick desaturation of the current color and resaturate into the new color. Colors not too far apart will simply change with the rotation method used in Rotation mode but much faster. ★ HEX file doesn't work! My name is João Figueiredo and you can contact me through the email address on the contacts page or using the form on the right.